Among some of the other major retail tenants at the development include Whole Foods Market, which will be opening a 69,000-square-foot location at the property. The location will be its largest in the DC Metro. A rendering of The Boro mixed-use development in Tysons, VA.
TYSONS, VA—Ethan Allen will relocate to a two-story location at The Boro mixed-use project, joining Whole Foods and other major retailers at the more than 2-million-square-foot first phase that will open later this year here. Meridian Group, the developer of The Boro, reports that home furnishings retailer Ethan Allen is relocating from its Route 7 location and opening an 11,500-square-foot store across two floors at the corner of Boro Place and Westpark Drive of the development. Other recent retail signings at the project include French bakery Paris Baguette, Verizon Wireless, a hair studio, a nail lounge, and restaurants Akira Ramen and Poki DC. The Boro’s first phase will feature nearly 2 million square feet of office, retail, residential and entertainment space. Among some of the other major retail tenants at the development include Whole Foods Market, which will be opening a 69,000-square-foot location at the property. 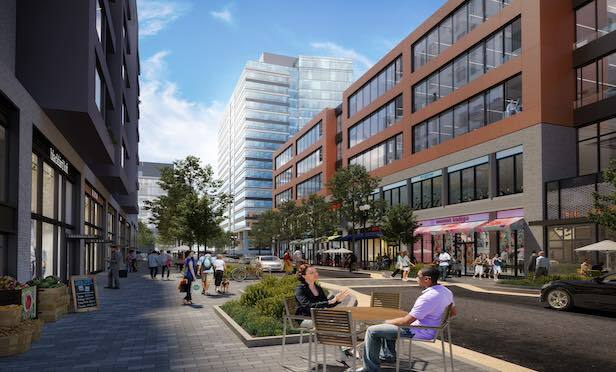 The location, which will be its largest in the DC Metro, will feature an outdoor mezzanine space with a fire pit overlooking Boro Place, an expansive bar area and food hall with chef-sponsored kitchen stations and will also have Amazon lockers and sell Amazon products in-store. The Boro will also feature ShowPlace ICON Theaters, a new cinema with 14 auditoriums featuring state-of-the-art audio and visual features, recliner seats, reserved seating, and an upscale food and beverage offering. Dave Ward and Geoff Mackler of H&R Retail represented Meridian on all the retail leases. Meridian Group made news last October with the signing of KPMG to seven floors at its office tower at the Boro. TEGNA Group recently took occupancy of the top two floors at the 20-story office tower, owned by Meridian Group and Rockefeller Group. Bethesda, MD-based Meridian has acquired and developed more than 14 million square feet of office, residential, hotel, mixed-use, and land focused mainly in the metropolitan Washington, DC market.